AP 6532 - High performance dual radio! The performance-focused dual radio 802.11n AP 6532 Access point provides customers with higher throughput and dual-radio performance while benefiting from WiNG 5 intelligence at the edge. 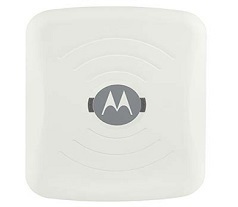 This versatile AP leverages Motorola’s hallmark 802.11n band-unlocked radios, allowing IT to use the second radio to provide WiFi access or serve as a dedicated wireless sensor that scans both 2.4 and 5 Ghz bands for network assurance and security. The AP 6532 can serve as a virtual controller and coordinate the operation of up to 24 neighboring access points for mobility and QOS services . Device and network performance can be accelerated through a virtual LAN feature via the switch/controller. Each access point can be virtualized into four unique VLANs, which can be customized to direct broadcast traffic to the intended recipient. This reduces overall network traffic while improving device performance and battery life up to 25%.